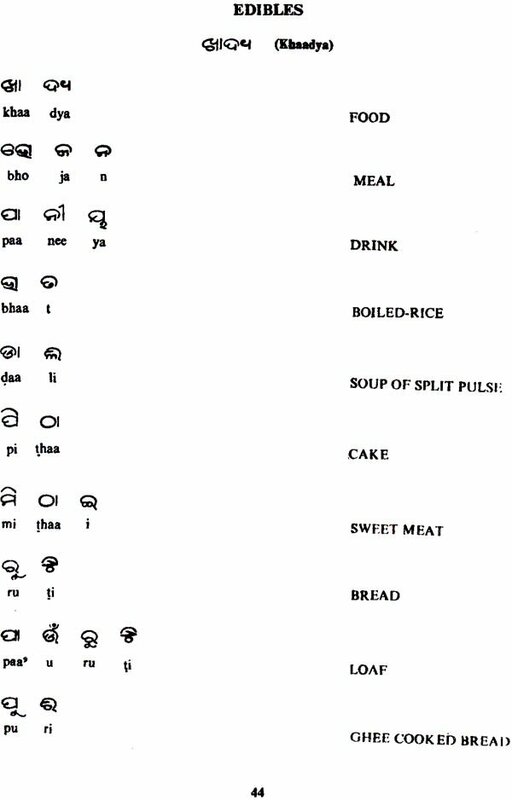 Oriya is an ancient language, the words of which derived mainly from Sanskrit, have gathered a rich heritage of association of ideas through centuries. 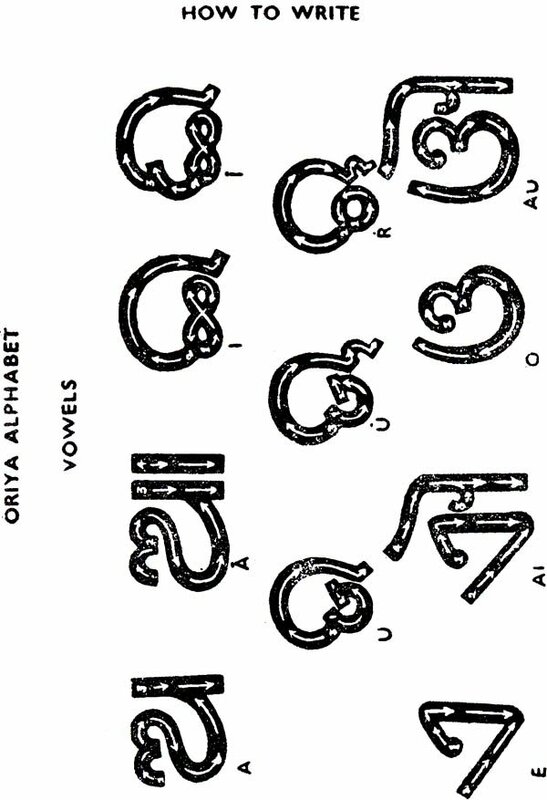 Oriya is spoken in the State of Orissa. It is also called Utkali or Odri from the ancient name of the State. It is also the language of South Midnapore, southern-most corner of Bihar, a little portion of Chota Nagpur, Sambalpore and the upper part of Ganjam district. It has Bengali and Bihari on the north, Hindi on the west, Telugu on the south and the sea on the east. It shows no dialectic variations worth mentioning. Oriya is a flowery language, highly poetic in expression, the words of which convey exquisitely fine shade of meanings. At the request of many, we are now placing before the public this book to learn Oriya through the medium of English. There is a good gap between English and Oriya. 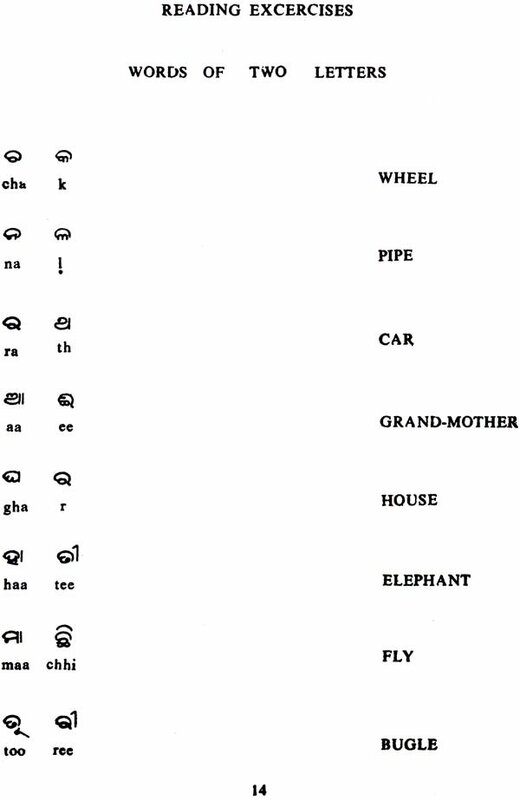 Oriya contains 47 letters while English has only 26. Therefore we have given dialectical marks to the letters to pronounce them correctly. This book has been divided into five parts. In the first pat the alphabets set out and the pronunciation explained, while a few reading exercises are added for illustration. These exercises are provided with key transliterations. The second part deals with some classified words with their pronunciation on useful topics. In the third part, one can learn to form simple sentences, and also the forms of conversation on useful topics. The fourth part deals with grammar. The method adopted here is very simple and intelligible. 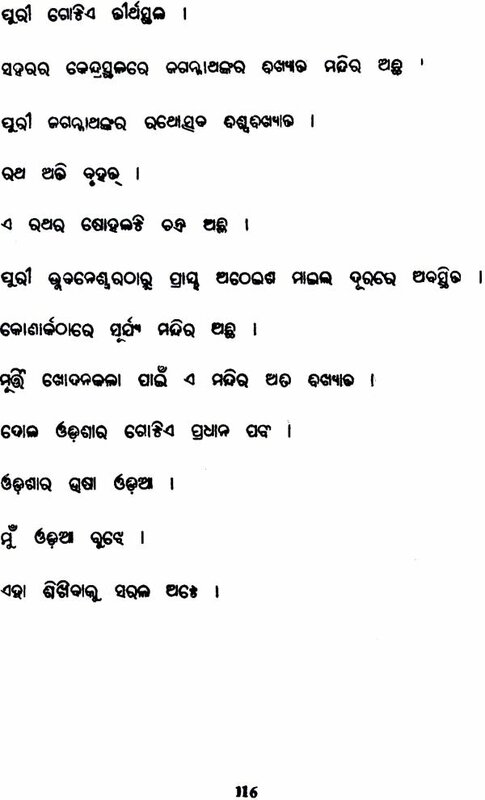 The fifth part deals with some useful sentences, simple letters, essays and small stories which are famous in Orissa. Hints to grammar have been given in alphabetical order so as to enable the learners to get a knowledge of the rudiment of the language. In the last pages pronunciation for the fourth part has been given. Greatest care has been taken in the choice of type which shall render the printing plainly readable throughout. 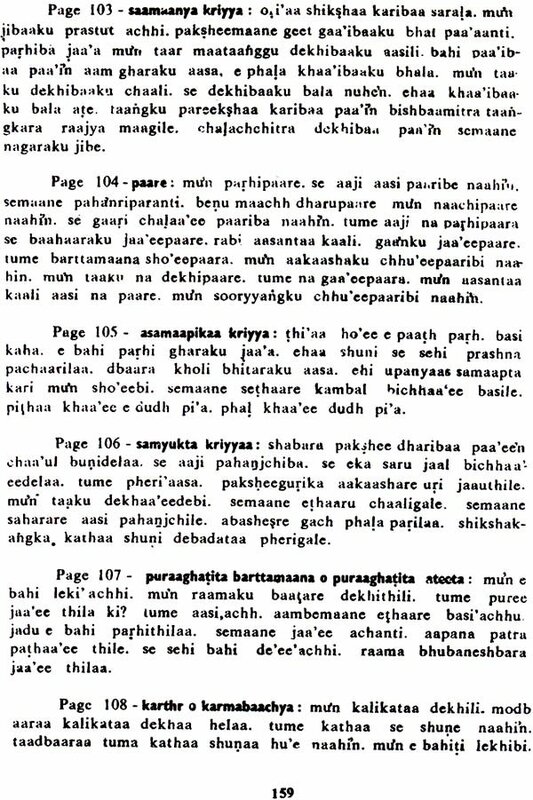 Lastly, I feel that it is my duty to record here my grateful thanks to Sri Kailas Mahapatra and Prakash Patra of Cuttack who have laboured hard to revise the entire manuscript. Any suggestions for the improvement will be thankfully considered. Ours, the Balaji Publications, is a pioneer project in the book publication field. Our motto is : 'Build National Integration through books, cementing the gap between the many languages.' There are 14 languages approved by our Constitution. Each language has its own vocabulary, literature and beauty. Though the people's mother tongue differs, there is a common connecting link that binds the people of Bharat. Whether they live in forests or bungalows, whether literate or illiterate, whether rich or poor, whether labourer or magnate, you can find this invisible thread of affinity where ever you go. That is our culture  the ancient tradition of Bharat. Mahatma Gandhi, Nehru and other patriotic leaders have tried their best to find 'Unity in diversity'. We sincerely feel that there should be no language barriers among Indians. Therefore we dedicate ourselves to the publication of this series, which in toto means learning other languages through one's mother tongue. To love one's own mother tongue is not at all a fault. It is natural. But at the same time that sort of attachment should not develop into language fanaticism. Our aim is, even a common man should have a basic knowledge of other Indian languages. Therefore, we have introduced a novel method for learning the other languages and have adopted the same procedure in this series. First we published some two or three books on other languages. People bought them and gave us overwhelming support. This encouragement makes us bold in our venture of publishing the series in the 14 languages through the medium of other regional languages so as to enable the people to learn all the tongues with the aid of their vernacular of English. With this aim, we have published so far, the Tamil, Malayalam, Sanskrit, Hindi and Gujarati versions. The present book 'Learn Oriya in 30 days' is also penned by a learned and experienced author. 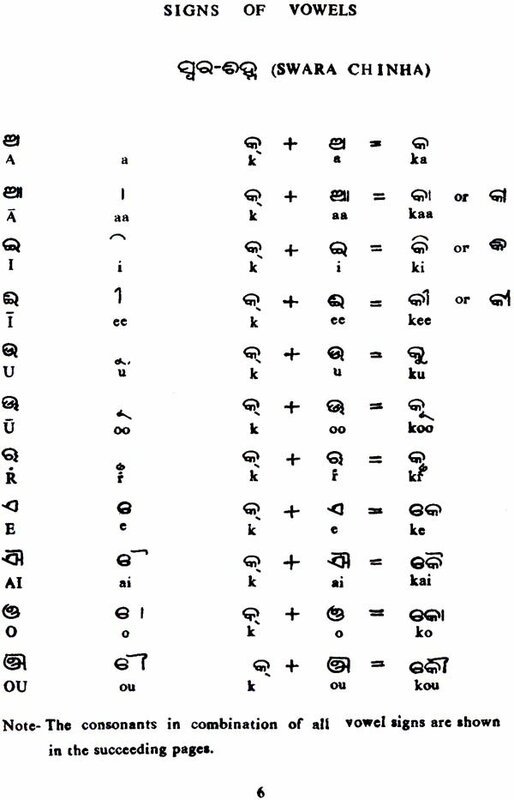 Oriya is a fine language with a vast literature. It can be learnt through English easily. On sincere thanks are due to our reserved Governor Hon. K. K. SHAH for his prompt reply to our request amidst his present enormous activities and responsibilities. We hope that our sincere efforts will be appreciated by the reading public. We have the pleasure of placing this book before the enlightened readers with the satisfaction that we are also doing a bit of service for National Integration. Did not the squirrel help Rama in the task of building the bridge across the ocean? 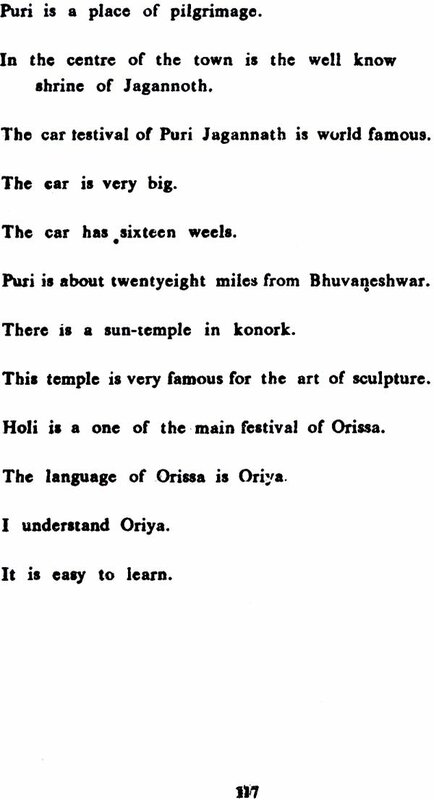 Can i have the the full print of Oriya Learning book.